NEW ORLEANS -- Visiting residents on tidy porch stoops and sampling the fried chicken at a corner restaurant, President Barack Obama held out the people of New Orleans on Thursday as an extraordinary example of renewal and resilience 10 years after the devastation of Hurricane Katrina. "There's something in you guys that is just irrepressible," Obama told hundreds of residents assembled at a bustling new community center in an area of the Lower 9th Ward that was once under 17 feet of water. "The people of New Orleans didn't just inspire me, you inspired all of America." He held out the city's comeback as a metaphor for what's happening all across a nation that has moved from economic crisis to higher ground. "Look at what's happened here," he declared, speaking of a transformed American city that was once "dark and underwater." Still, Obama acknowledged that much remains to be done. And after walking door to door in the historic Treme section of a city reborn from tragedy, he cautioned that "just because the housing is nice doesn't mean our job is done." There is more to be done to confront "structural inequities that existed long before the storm happened," he added. In his remarks at the community center, Obama blended the same themes of resilience and renewal that he drew from encounters with the sturdy residents he met along Magic Street and at other locations. Leah Chase, 92, was one of those to chat with Obama, and pronounced herself a fan of the man, saying he'd handled "a rough road." "That's all you have to do: handle what's handed to you," Chase said, voicing what could be a credo for the city. Obama was clearly energized by his visits, at one point breaking into a song from "The Jeffersons" sitcom after meeting a young woman who calls herself "Ouisie." He stopped for fried chicken at Willie Mae's Scotch House, and pronounced the resulting grease stain on his suit a good indication that he'd enjoyed his stay in the city. He held out the community center as "an example of what is possible when, in the face of tragedy and in the face of hardship, good people come together to lend a hand and, brick by brick, block by block, neighborhood by neighborhood, you build a better future." Obama was a new U.S. senator when Katrina's powerful winds and driving rain bore down on Louisiana on Aug. 29, 2005. The storm caused major damage to the Gulf Coast from Texas to central Florida while powering a storm surge that breached the system of levees meant to protect New Orleans from flooding. Nearly 2,000 people died, most in New Orleans. Video of residents seeking refuge on rooftops, inside the Superdome and at the convention center dominated news coverage as Katrina came to symbolize government failure at every level. 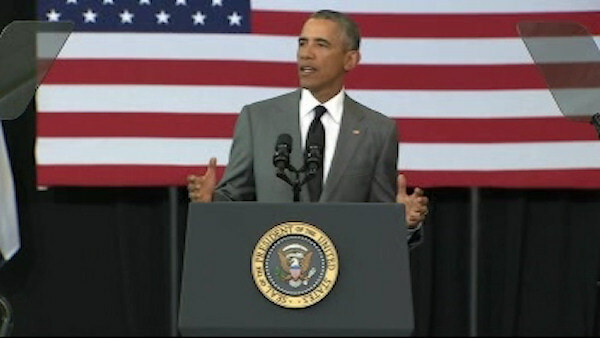 In his speech, Obama said Katrina helped expose inequalities that long plagued New Orleans and left too many people, especially minorities, without good jobs, affordable health care or decent housing and too many kids growing up in the midst of violent crime and attending inefficient schools. The setting of his address at the community center spoke to the stark contrasts that remain. It sits near nicely renovated homes but also next to a boarded-up wooden house. The area is filled with vacant lots where houses used to stand, so overgrown that local residents sometimes refer to it as the wilderness and worry about snakes hiding in the grass. Colette Pichon Battle, executive director of Gulf Coast Center for Law & Policy, cautioned against slapping too happy a face on New Orleans, saying "rebuilding since the storm favors privileged private enterprise and this illusion of recovery is not progress." City residents, too, spoke of uneven recovery. "I think we have a long way to go," said Lisa Ross, 52, an appraiser. She said areas frequented by tourists have recovered tremendously but many neighborhoods have struggled. Harold Washington, 54, a military retiree studying at Tulane, said the city is "better than it was." But he was sad that children are now bused all over town rather than attending neighborhood schools. Obama spoke hopefully of coming back to New Orleans after his presidency - when he can go to Mardi Gras and sample other delights. "Right now," he said, "I just go to meetings."